Long before Geneveve was born, I followed this blog and marvelled at this woman’s recipes, attention to detail in her son’s lunches, and hoped that I could be as put together and passionate in the kitchen when I had kids. Maybe the fact that her kid is NOT a toddler is the reason she is rested enough to have the energy and drive to be fun in the kitchen again. I hope it’s not just me! But I did have a moment of clarity and inspiration in the kitchen and whipped up these vegan goldfish crackers. It was quick, easy and they are tasty. But Eve doesn’t care about them (for now). I got a little duck cookie cutter (couldn’t find a fish one locally) and I will make them again but for now Eve loves her Barbara’s O’s above all else. My only changes were to use white whole wheat flour and 1 tsp annatto seed, ground in the coffee grinder for color. They didn’t puff up like goldfish should, maybe I should have rolled them thinner or baked them sooner or overmixed the dough? I know this isn’t actually “food” but it seems to belong more on the food blog here than the life with baby blog. The ingredients are edible and from my kitchen at least. And there’s a recipe involved. And I thought you’d enjoy this info more than grandma who just wants to see pictures of the little one. Sometimes it’s easy to forget that I live in such a green bubble here in Portland. Last year I decided to give up on commercially produced deodorant for a few reasons. Most deodorants are full of chemicals and toxins. toxic deodorant has been linked to breast cancer as the skin of the armpit is near breast tissue. And skin absorbs toxins easily. That’s scary enough for me. The natural deodorants are *expensive* and don’t work for me. I’ve tried plenty to no avail. Deodorants are usually in a plastic container (does anyone recycle them? are they recyclable?) and in a box. 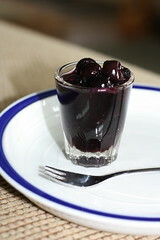 This recipe uses bulk ingredients and is in a small glass jelly jar. Practically no waste. Smaller footprint. You get the picture. A friend led me to this great blog with a deodorant recipe that is easy and quick to whip up at home. I already had the ingredients on hand, which was a bonus. Don’t be scared off by the high price of coconut oil. It goes a long way! The deodorant I made in February still has at least another month left to it. You can find coconut oil in bulk at co-ops or health food stores, or if you live in Portland, pretty much everywhere. If you can’t find it in bulk, check the cooking aisle or the wellness department. Mix the oil and butter together (You may need to microwave the coconut oil, as it solidifies at room temperature). Add the baking soda and arrowroot and mix well with a fork or whisk or whatever you have on hand. Add tea tree and essential oil of choice (in quantity of choice). Mix well. Store at room temperature or the fridge. I don’t know if it expires. The batch I made 7 months ago is still going strong. I love this deodorant because I know what’s in it. No mysterious ingredients, fillers, preservatives, chemicals or ground up beetles. Some people just brush baking soda on their pits or rub coconut oil…but this blend has been working for me pretty well. I learned the hard way to not to put it on right after shaving. At room temperature it’s soft and if it’s summer it liquifies (some people keep it in the fridge). I use about a pea sized amount per armpit. One thing to remember is that this is deodorant, NOT anti-perspirant. You will still sweat. Which is important and is part of our human design. Also it helps to remember to put it on every day; I keep it near the shower so I don’t forget. But of course that means I only remember when I have time to take a shower. Cocoa butter smells fabulous (chocolate!) It can clog pores, fyi. It is very shelf stable and melts on your skin. Baking soda is the magic ingredient in so many natural cleaning things. I use it to scour my sinks (then pour a little vinegar over it), clean my water bottles, bake cakes and now for my deodorant. I was using it to wash my hair but gave up on that malarky. Baking soda absorbs the sweat and neutralizes odors (unlike the typical deodorants that cover up your stink with frangrances…so you can smell like stinky flowers or cologne and sweat socks…no thanks) Keep in mind some people are sensitive to baking soda. If you get rashy, try using less in your mixture or take it out altogether and add more cornstarch. Arrowroot and cornstarch work to thicken the mixture, as they would thicken your gumbo. Tea tree oil is renowned for it’s natural antibacterial disinfectant properties. It can fight fungus, bacteria and viruses. And it’s medicinal (can you tell by the smell?) But a few drops in the deodorant aren’t really noticeable once it’s absorbed on your skin. The goal is to fight the bacteria living in your armpits. Give it a try and let me know what you think! I was impressed at how easy it was to make and how effective it is. Oh, rhubarb. The first fruit of spring. The leaves and roots are toxic but the stems cook down to such a delicious tart treat. My parents had a large patch of it so I was shocked to see how expensive it is in the store. I planted a small crown a few years ago and this rainy spring it really took off! I usually make this crisp the first go round, then my mom’s rhubarb bread. Later this week I’ll make some muffins with them. I love strawberry rhubarb pie but I find pie crust too fussy and this crisp comes together quick enough with a little one trying to pull your pants down while you bustle around the kitchen. I highly recommend making two. In my household one gets eaten too fast and there’s no room for blame with something so delicious as this. You can slice your fruit the night before if your time is limited, as I have discovered mine to be. Cream butter and sugar in a medium bowl. Add remaining ingredients and spread evenly over crisp filling. Bake 30-35 minutes, until filling is bubbly and crisp is golden. Cool (if you can wait…if not it will be a little watery but still delicious). Just a quick reminder that my last scheduled class for the summer is coming up. Do you enjoy eating plant-based foods and incorporating tempeh and tofu into your healthy eating plan? Learn to make these healthful foods at home—it’s affordable and tastes better than store bought! Join Kim in this demonstration and tasting class as she shows you how to create these versatile vegetarian and vegan staples. She’ll also share an easy recipe for these healthy foods, which you can recreate at home. Get my blog entries in your inbox! Once upon a time I loved the RSS feed. Then most of the blogs I read stopped updated and I lost interest in going to my Google Reader to find out there was no new news. But I will always check my email and have found that some people only have time to check their email and not specifically go to websites or readers. So it is to those readers I unveil the email subscription link. It’s at the top of the right side toolbar and is easy to set up and convenient. Then you can receive emails with my newest blogs instead of obsessively checking my blog every day to see if there is a new post. I can guarantee you I won’t be blogging on a daily basis any time soon, but the entries will continue as long as my spice drawer is stocked. One thing I have missed from our house in Seattle was our mini-orchard. We had so many fruit trees (plums, apples, pears) that came with the house and produced abundantly. I love being able to walk barefoot in the yard and pick some fruit to eat. Our current house has a much smaller yard (less maintenance!) and while we could plant fruit trees and wait, there’s something satisfying about established trees in your yard. We found out last year that we have a monster Rainer cherry tree that produces fruit higher than we can pick and an amazing grape vine. It’s rooted on our neighbor’s side of the fence, so hopefully they don’t get rid of it any time soon. Most of the vine grows onto our side of the fence and I expected to get a few bowls of grapes for snacking. Try thirty pounds! My parents grew grapes and I always enjoyed snacking on them and spitting out the seeds. The concept of seedless grapes to me was always strange, those were “grocery store” grapes. I have a distant memory of my parents making grape jam one fall. They took over the whole kitchen and I’m sure there was frustration in the air because grapes stain and they are messy. And they have skins and seeds. But the taste of that jam was SO delicious. Better than any Welch’s sugar syrup with grape flavor. I think they only made the jam once and left most of the fruit for the birds. So I’m not sure if I was crazy to attempt to process our grape harvest but I am not one to let things go to waste. I had an encouraging canning partner, the Mayor of Hooperville beside me with ideas and energy and a shared passion for domestic arts. We went to town on those grapes. It was a project that lasted more than one day and included some fails and some wonderful stand-bys that I plan to use this fall (much more efficiently I might add). Our plan: grape jam (lots of it! ), grape juice concentrate and pickled grapes (of course). No wine trials this time around. There is way too much to go wrong and a lot of equipment needed that I am not ready to invest in. 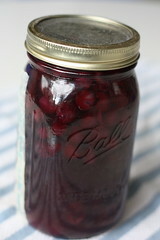 The pickled grapes were relatively easy and the flavor was good. I found a recipe in the September 2009 edition of Vegetarian Times for them. It was very straightforward and was a fun savory experiment for grapes. My only gripe was that this recipe is for seedless grapes (which I disregarded) so when eating these pickles you end up spitting out a lot of seeds. I’d rather make pickles from cucumbers and save my grapes for jam and juice. 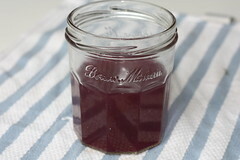 The jam was the main goal for us and after some trials and staining most of my dishtowels, a great success. 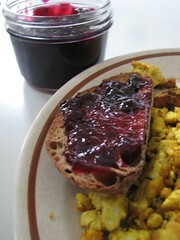 We tried the recipe from epicurious (Concord Grape Jame Oct 05) but the process was very laborious and time consuming. You have to peel the grapes, puree the skins, then add them to the naked grapes and cook it down, THEN strain it and cook it down some more. It seemed like there were a lot of unnecessary steps but I wanted to try the recipe because it didn’t call for any pectin. Which is too bad because it never gelled. We had it on the stove for hours and ended up burning it. We tried a batch in the crockpot and ended up caramelizing it (grape molasses, anyone?). It was a waste of time and now I know. I am in love with Pomona’s Pectin. Most pectins rely on sugar for gelling so that’s why the majority of jams and jellies out there are loaded with sugar. When a fruit is ripe and at it’s peak, you don’t need to add much sugar, which is why I adore Pomona and her genius. After our epic fails, we followed the recipe in the Pomona box and not only did it gel, but it turned out tasty and not overly sweet. For those of you who want to try it, for one batch I used 7 pounds of grapes to make 8 cups of juice, 1/2 cup of lemon juice (I wonder if apple cider vinegar would work?) and 3 cups of evaporated cane juice to yield 6 pints of jelly. I figured for the first time I would go in the middle of their sugar recommendation range. This method was much easier, used less equipment (less cleanup) and we didn’t have to peel the grapes and go insane and it took two days because the juice needs to drip out overnight, which wasn’t a big deal. I don’t have a jelly bag and I just used 3 or 4 layers of cheesecloth in a strainer over a bucket. It involved some waiting time but I’d rather deal with it the next day than have to peel grapes ever again. I know there has been a lapse on my part in blogging. I have been blogging in my head but not online because my time in the kitchen has slowed. I had a few epic projects this winter that I will share with you but this spring has consisted of simple meals and very little photography as my focus has shifted to a state of pregnancy, which apparently means hours on my feet in the kitchen haven’t been enjoyable. But I am feeling great and past the food aversions, which is wonderful to enjoy food again. I had my first food craving last weekend, which was a crazy experience. All of a sudden I wanted needed horchata. Living in Portland around so many Mexican food carts you would think this craving would be easy to appease. We went to 4 taco trucks and a Mexican restaurant to no avail. But this was a craving… an experience unlike anything I have ever felt. Sometimes I desire certain dishes or ingredients but if I don’t have it on hand it’s not a big deal. This was a big deal. When I realized I wasn’t going to find my horchata I wanted to cry. I admit I did cry. My muscles seized up and I felt paralyzed, unable to make decisions. All I could think about was the creamy refreshing taste of horchata that was not in my possession. Back at home my husband went to try one last taco truck by our house (no luck) while I had a revelation that there were almonds soaking in the fridge. Why not make my own? It would take less time than driving all over the city and crying for want of horchata. So I did. And it was delicious and the beast was appeased. I must mention that traditionally horchata is made from white rice, usually ground and soaked overnight then blended with cinnamon and sugar (and strained). I have seen a few recipes around that use a combination of rice and almonds but as I did not have the patience to wait 8 hours to soak rice I made a quickie version that satisfied me to no end. I promptly drank my beverage and took a nap. Here is the recipe, it made one pint so if you want to share I suggest doubling or tripling the recipe. Drain the almonds and rinse them. Place them in a blender and blend until pulpy (you may need to add a little water if your blender is old and weak like mine is). Add remaining water, blend until smooth. Strain using a nutbag, tripled cheesecloth or whatever works best for you. I’m sure this would last 5 days in the fridge but I haven’t tested it yet. Horchata never lasts longer than 10 minutes in my hands. Just a heads-up, I’m scheduled to teach a few cooking classes at New Seasons this winter. Come join in the fun! You can register by phone or in person at the Happy Valley Store. 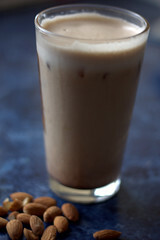 them into flavorful, nutritious smoothies, perfect for enhancing any resolution – New Year’s or otherwise. is bubbling in the oven, Kim will teach you the basics of salad composition and dressing. Add a basket of garlic bread and the meal is complete! 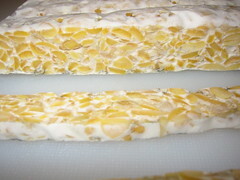 Do you enjoy healthy eating with tempeh and tofu? Did you know that you can make these tasty, versatile foods at home? It’s affordable and tastes even better than store-bought! In this demonstration and tasting class, Kim will instruct you on how to create these vegetarian and vegan staples. She’ll also share with you an easy recipe for preparing these healthy foods at home.